The PXIe-8394 allows you to create multichassis PXI systems that interface to the same computer. You can use the PXIe-8394 to daisy chain up to eight PXI chassis to the same system computer, which can be a PXI controller or a PC connected with a device for PXI remote control. 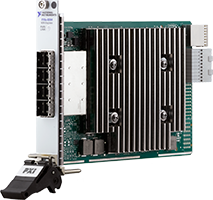 You can also extend the PXI system by connecting RAID arrays, software-defined radio devices, and software-defined reconfigurable radio devices.